The Supreme Judicial Court ruled today there was nothing unconstitutional about a judge ordering a woman charged with stealing from a dog-walking client to pay for her heroin addiction to undergo drug tests as a condition of letting her go without any jail time - and then ordering her into in-patient treatment when she tested positive. Read more. Each pill had a small picture of Marge Simpson on them. Police checked online and reported the pills were a limited edition Tic-Tac. Yeah, you. A study of nearly two millennia of microscopic growth at the bottom of the pond helps confirm an earlier report that "more than half of the summer phosphorus budget of the lake may now be attributable to urine released by swimmers." Read more. They are advised to talk to it calmly while backing away. Talk to it calmly? Unfortunately, WBZ fails us and doesn't specify just what we're supposed to say as we calmly talk to the bear. Whisper sweet nothings? "Hey, how 'bout that Gronk!" What? A Massachusetts man who says his Florida partner walked away from the idea of selling mugs carved out of the hollowed out barrels of baseball bats is now suing him because the guy got back into the baseball-bat-mug business. Read more. 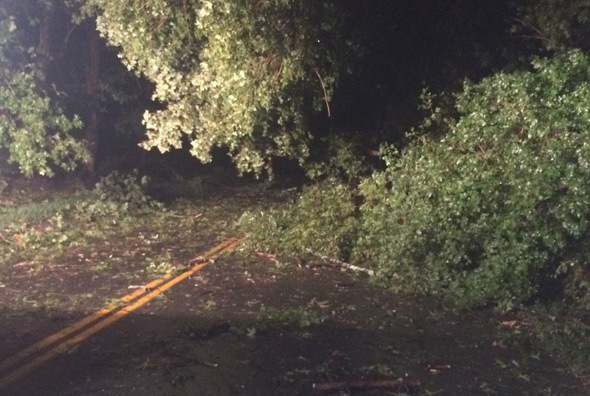 Concord Police posted this photo of a blocked street at 4:27 a.m. The National Weather Service reports a tornado briefly touched down in Concord early this morning: Read more. A man wanted across eastern Massachusetts for a variety of crimes - including attacking a Boston cop - was arrested in Concord last week for allegedly stealing expensive eyeglass frames from a health center. Steven Stanley, 44, of Weymouth, faces charges of larceny over $250 in Concord, Burlington, Braintree, Natick, Randolph and Wrentham. He faces three warrants in Boston for larceny over $250, in addition to a charge of assault and battery on a police officer. Natick also wants him for assault and battery. Read more. How fast can a commuter-rail bridge be replaced? The T has posted a video of a weekend replacement of a Fitchburg Line bridge over Rte. 62 in Concord - compressed to just four minutes. LensProToGo, which rents high-end camera gear, reports somebody spent some serious time smashing a large hole in a wall to rob its Baker Avenue Extension warehouse over the weekend. They've posted a list of the stolen lenses and their serial numbers. Read more. The men offer to remove snow or remove fallen or unwanted trees from the resident's yard. Once the men do a minimal amount of work, they get aggressive and try to get the resident to pay them thousands of dollars before they get suspicious or think better of it. Yes on 2! The Coalition to Update the Bottle Bill Needs Volunteers! We need to stop litter and keep Massachusetts clean by spreading the word about the Yes on Question 2 campaign. The Bottle Bill is the most effective recycling tool we have. Eighty percent of bottles covered by the Bottle Bill’s 5-cent deposit are recycled. Yes on Question 2 would add a bottle deposit to water, sports drinks, tea, juices, and other drinks that were not included in the original bill because they were not popular when the law was passed in 1982. We need your vote on November 4 to update the Bottle Bill. UPDATE: Never mind, DCR says. Calendar of Patriots Day events - some this weekend. The list is, however, missing the annual re-enactment of the rides of Paul Revere and William Dawes.